I love everything about summer, especially seeing what is growing my vegetable garden. My kale, basil, and tomatoes are explosive. We have had huge thunder showers, so I haven’t had to water much lately. 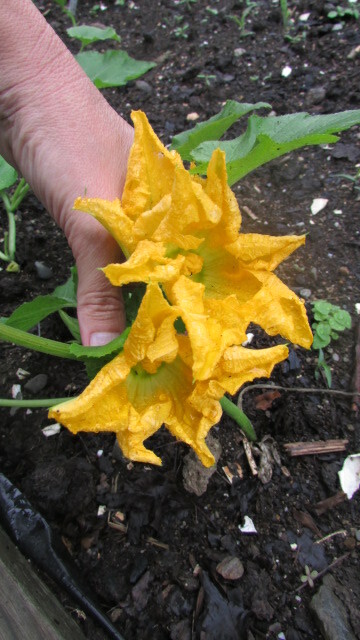 My zucchini and squash blossoms are just coming out. 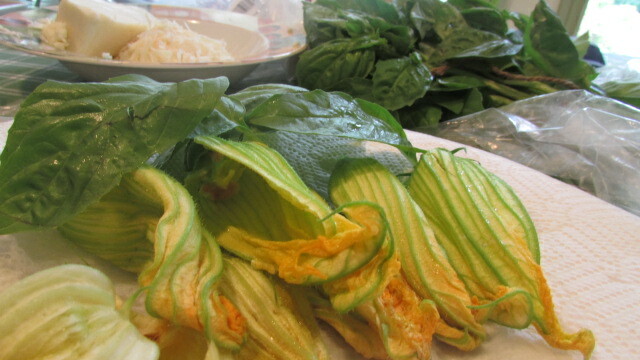 When my neighbor told me that he has lots of butternut squash blossoms and zucchini blossoms and would I like some, I couldn’t get my sandals on fast enough! I decided to stuff them with Mozzarella, Parmesan Reggiano and Basil. 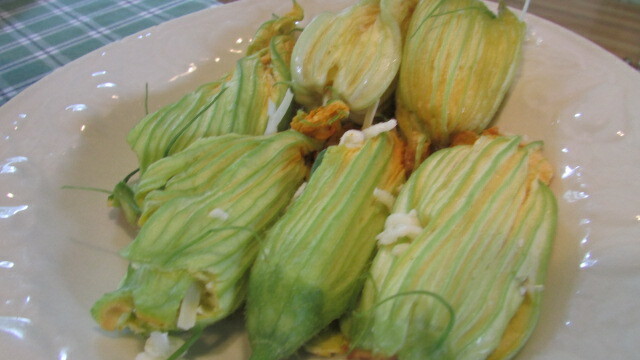 You can actually stuff blossoms with any kind of cheese that you like, ricotta, goat, gruyere, or with meat or rice. I have had them many ways, all so delicious. 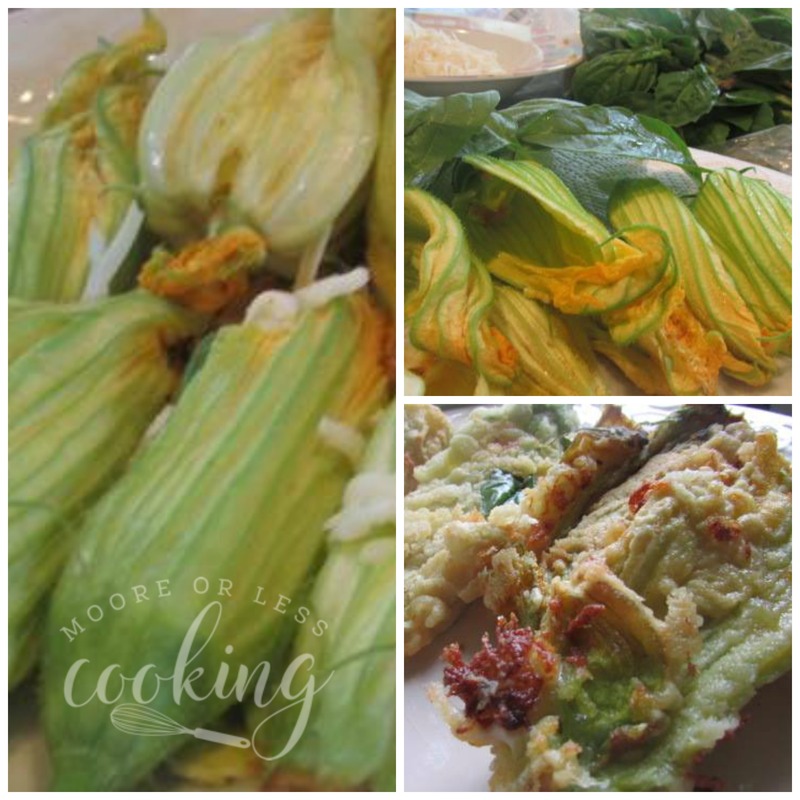 For 7 Blossoms, I grated about 1 cup of Mozzarella Cheese and added about a 1/4 cup of Parmesan Reggiano Cheese, I ripped up freshly picked basil leaves and stuffed the blossoms. Twist the ends closed and try to pinch the blossoms closed so that the cheese doesn’t fall out. Fill skillet pan with about an inch of vegetable oil, carefully place stuffed blossoms in pan on medium high heat, saute until golden brown. 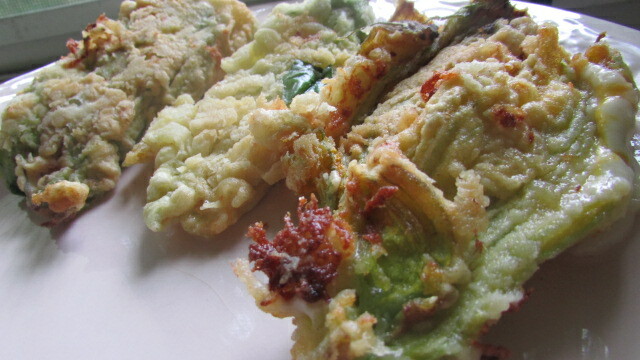 These are a delicious summer treat, a perfect appetizer with a cold glass of Chardonnay! 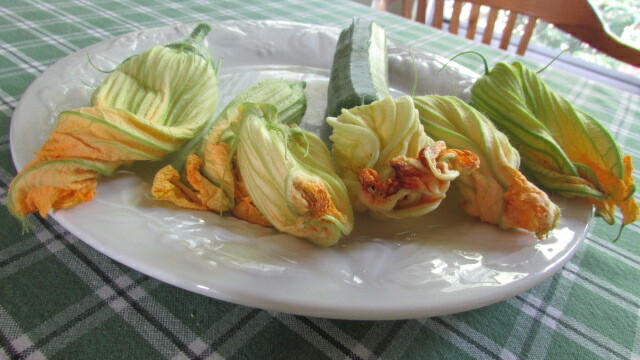 Wash squash blossoms. Take the stamen out from inside the blossom. Pat dry. In a small bowl, combine Mozzarella , Parmesan, and basil. 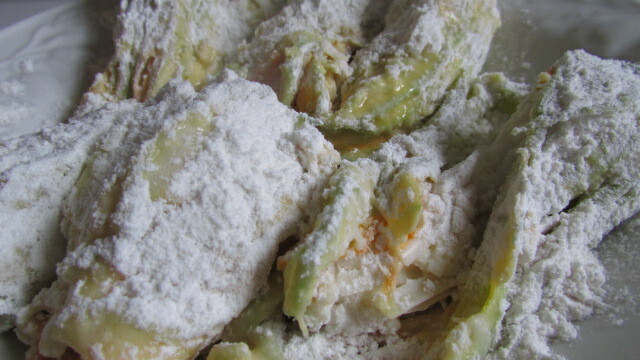 Carefully fill the blossoms with the cheese mixture. Twist the top of the blossoms to close off, repeat with remaining blossoms. Place the flour in a shallow bowl and add the pepper and salt, mix. Beat the eggs in a bowl and place next to the flour. 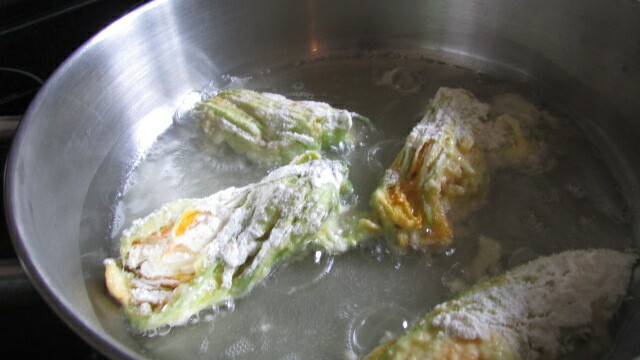 Cover the squash blossoms in flour mixture, then in the egg wash and back in the flour, until very well coated. Repeat with remaining blossoms. Pour oil into a rimmed frying pan, filling about 2-3 inches. Heat until hot but not smoking, about 350-380 degrees. Carefully fry blossoms in batches, until a nice golden brown color. Serve warm. These are one of The Hubby’s fave appetizers. I just might have to surprise him one night! Thanks Nettie! I’ve always wanted to try these Nettie. Yours look delicious. I really need to try these, they look amazing. Your recipe sounds easy enough. I’ve always thought about making stuffed squash blossoms but was intimidated, but now I think I’ll give it a try. One of our specialty markets has them this week, they’ll be on my list next. Pinned/shared. 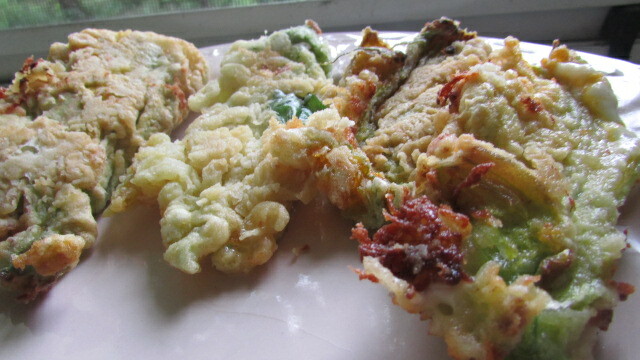 I love stuffed squash blossoms but have never tried making them. Now i have a fantastic recipe…thank you so much! stuffed blossoms are the best! I love mine with ricotta and mint!